In April 1862, a Union spy named James J. Andrews and about 20 compatriots planned to steal a Confederate train (nicknamed "The General") in Georgia, then drive it north while burning bridges behind them. The idea was to disrupt vital Confederate supply lines. 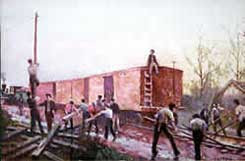 Unfortunately for Andrews and his men, the stubborn efforts of a Southern conductor named William Allen Fuller got them all caught after a long chase through Georgia and Tennessee. that gives a step-by-step account of the action. Check it out if you're interested. We, though, will be concentrating on the two excellent (and in one case--classic) films that were inspired by the Raid. The General (1927) might very well be the funniest movie ever made. 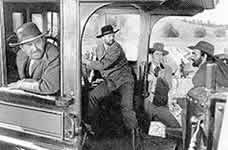 Quite properly eschewing historical accuracy, The General takes the idea of a stolen train and a chase involving locomotives to set up some of the most innovative sight gags and physical comedy ever put on film. Buster Keaton--the funniest man ever--plays the lead role. 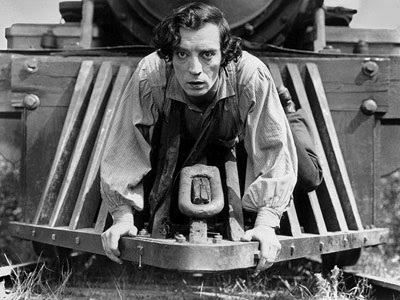 He's the General's engineer and when the Union raiders steal his beloved train (and inadvertently kidnap Keaton's erstwhile girlfriend), Keaton pursues them relentlessly. What follows is comedy heaven. Much of Keaton's comedy revolved around a sort of undeclared war between himself and an assortment of mechanical/inanimate objects. In The General, this theme is built upon magnificently. It literally doesn't get any better than this. And the gags are all the funnier when you remember that these were done without any special effects. That's really Keaton on a real train that's really moving, really doing all that stuff. Take a look at this clip from The General, which includes some interesting commentary. 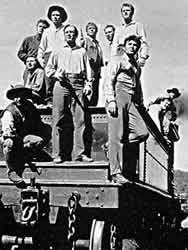 In 1956, Walt Disney used Andrews' Raid as the plot for The Great Locomotive Chase, with Fess Parker as Andrews and Jeffrey Hunter as conductor William Fuller. I once read that Disney made this film so that Walt would have a chance to himself play with the locomotives uses in the movie. I have no idea if this is true, but if it is, I sympathize with Walt entirely. The trains in this film are just plain fun to look at. And the story is done well. The plot is a simplified but (for a movie) reasonably accurate recounting of the Raid. Parker (famous at the time for playing Davy Crockett) and Hunter are both very good in their roles and the story (which also includes the jail break attempted by the raiders after their capture) is exciting. The Great Locomotive Chase is not the classic that The General is, but it is a good, solidly entertaining movie in its own right. The two films together actually make a fun double-feature, looking at two different ways of channeling a real-life event through the imaginations of creative film-makers. 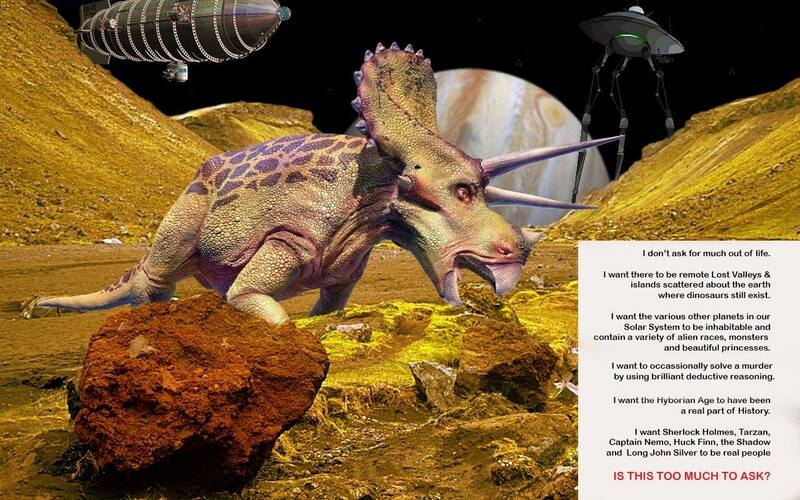 My money's on the pterodactyl. Here's a super-cool illustration by master artist J. Allen St. John. 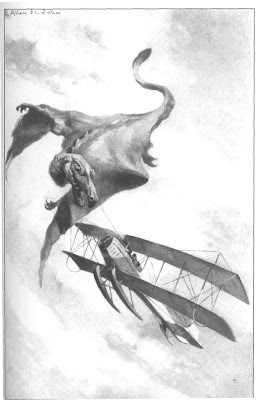 It's from a 1924 book edition of Edgar Rice Burroughs classic story. One really neat thing about it is the design of the pterodactyl. It's hardly a model of scientific accuracy, but it looks "just right" all the same. It's easy to understand the appeal of an historical mystery. Set in the past, before there was any such thing as forensic science, the mystery must be solved by the detective using oinly his or her wits. It is mystery in its purest form. The most famous historical mystery series might be the Brother Cadfael books by the late Ellis Peters. Well-constructed plots with a likable main character make these well your time to read. Many entertaining historical mystery series use a real-life person as the detective. Within the pages of such novels, guys like Mark Twin, Charles Dickens, Leonardo da Vinci and even Groucho Marx have had their chances to catch killers. For my example of a good historical mystery, I'm going to turn back the clock to the American Reconstrucion Era and make note of a regrettably short-lived series that came out in the 1990s. No Bottom, by James Brewer, was the first of five fun mystery novels set along the Mississippi in the 1870s. The main characters are riverboat owner Luke Williamson and alchoholic former Confederate cavalry officer Maisy Baldridge. The two become involved in a mystery surrounding the sinking of a one of Williamson's boats. Baldridge, working for an insurance company, investigates and the two men end up working well together. In later books, the two men work together on other cases and Baldridge eventually opens a detective agency based on Williamson's remaining boat. No Bottom has a good, solid plot with interesting characters and well-described action sequences. It's accurate in its historical details and, well, a riverboat on the Mississippi is just an inherently cool setting for the series. Sadly, the series only ran for five books before ending. But all five are worth looking for. Ed McBain (the pen name of Evan Hunter) wrote the "87th Precinct" novel--Cop Hater--in 1956. The last--Fiddlers--was published in 2005, the year McBain died. That's 55 books in 49 years (and McBain wrote a lot of stuff outside this series as well). But it's quality as well as quantity that makes McBain the obvious choice for great Police Procedurals. McBain's protagonists--most often detective Steve Carella--are are believable characters that you can easily accept as real human beings. Particularly appealing about Carella is the loving relationship he maintains with his deaf-mute wife, Teddy. The very first 87th Precinct book I ever read included a scene in which a beautiful witness comes on to Carella. But Carella shows an almost casual desire to remain faithful to the woman he loves--something that marks him as a thoroughly decent human being and instantly puts the reader firmly on his side. Good characterizations are, of course, particularly important in a procedural novel. Whereas traditional whodunits and most hard-boiled detective stories are set in a world at least slightly removed from reality, procedurals use real life police methodology to generate drama and suspense. You have to believe in the people you meet within the framework of such a story or none of it will hold up. Carella and his fellow cops live in a fictional city roughly analogous to New York City. Other than the fact that none of them age appreciably over a half-century, McBain keeps the realism level high. His plots are as solid as his characterizations and (though some of the novels are better than others) I don't think there is a single 87th Precinct book I failed to enjoy. It's interesting to note, though, that within the realistic confines of the police procedural, McBain does manage to pay tribute to other mystery sub-genres. Killer's Wedge (1959), for instance, involves Carella using some old-fashioned deductive reasoning to solve a locked room mystery. 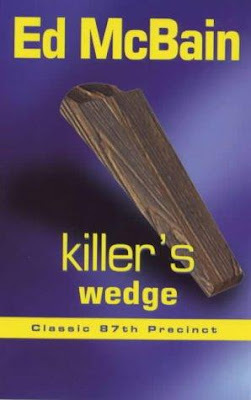 Killer's Wedge is a hostage drama, as well. While Carella is solving his case, the rest of the cops are being held at gun point back at the precinct house by a revenge-crazed woman. It is in every way a fun novel. Several other novels, such as The Heckler and Fuzz, feature a master criminal known only as The Deaf Man, who functions as a reoccuring arch enemy. King's Ransom is a kidnapping story, while Lady Killer involves a race against time to stop a killer. But most often we find a basic police procedural plot lying between the covers of an 87th Precinct novel. Perhaps the most entertaining example of this is Hail, Hail, the Gang's All Here (1971), which covers one 24-hour period at the 87th Precinct. Rather than follow just one case, this one is basically a series of interlocking short stories, with each detective assigned to the Precinct investigating a different crime. It is yet another fun read, highlighting McBain's skill at solid plot construction as well as sharp characterizations. How do you pick an example of the best traditional whodunit? Even if you stay with just the cream of the crop--Arthur Conan Doyle, Agatha Christie & Ellery Queeen--the thought of picking out just one example can make your brain explode. There's just too much good stuff to pick from. But, by golly, I write for a blog which has a bare handful of regular readers at best, so there's no sense in letting my brain explode. I will force myself to choose--more or less at random--Agatha Christie's Belgium detective Hercule Poirot. All great whodunits have to have appealing main characters. Poirot is vain and egotistical, but he's undeniably brilliant and oddly likable. Retired from the Belgium police force, Poirot travels the world. But wherever he goes, someone is inevitably murdered--the local police are baffled--and Poirot steps in to take a hand. The novels always have a "Watson" character, someone who assist Poirot and narrates the story. 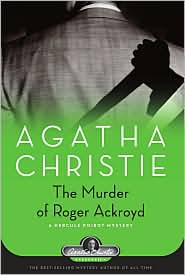 In the 1926 novel The Murder of Roger Ackroyd, the "Watson" is Dr. Sheppard, the local doctor in the small English town where Roger Ackroyd came to an untimely end. It's a traditional and effective conceit, letting the reader get all the same information the detective gets, but obligating us to figure it all out for ourselves, since we are not privy to the detective's private thoughts and theories. At their best, Christie's best novels feature the best mystery plots ever. She was a master of having the least likely suspect turn out to be the guilty party. In fact, if you pick out the least likely suspect and just assume he or she is guilty--well, you'll still be wrong, because it will turn out to be someone even less likely. The Murder of Roger Ackroyd is a prime example of this. The revelation of who the killer is will--in all likelihood--make your brain explode. If you've never read it, do so soon. But do not peak at the ending. Allow yourself to properly experience one of the best plot twists that have ever graced the printed page. I was in a conversation the other day about the best detective/mystery novels ever. Of course, it's pretty much impossible to list a single "best ever" because there is so much variety within the genre. There's the traditional whodunit, the American hard-boiled detective, historical mysteries, amatuer detectives and so on and so one. Every single one of these sub-genres has produced some excellent stuff. So that gave me an idea for a new blog series, covering a sample book from each of these sub-genres. Each book will be, in my humble opinion at least, one of the best of its type. We'll take a slug of bourbon from the bottle in our desk drawer and start with the hard-boiled detective. Born in the pages of Black Mask magazine in the 1920s, the hard-boiled style of writing is sparse and powerful, telling often complex stories in a relatively few pages. The hard-boiled detective is a tough man in a tough world, surrounded by violence and corruption. But he himself must have a strong sense of honor--a set of personal ethics that he holds inviolate. As Raymond Chandler writes in his essay "The Simple Art of Murder "...down these mean streets a man must go who is not himself mean, who is neither tarnished nor afraid." Dashiell Hammett did not publish the very first hard-boiled story, but he's still pretty much the father of the genre because he did it so darn good. 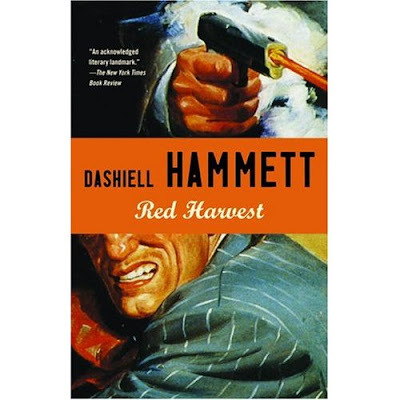 Many people consider The Maltese Falcon to be his best novel (and with good reason), but I always lean towards Red Harvest as being my personal favorite. Originally serialized in Black Mask, it was later re-written slightly and published as a novel. The Op is a coldly professional P.I. who seems to live only for his job. In an earlier story, a character referred to him as "A monster. A nice one, an especially nice one to have around when you're in trouble, but a monster just the same, without any human foolishness like love in him, and - What's the matter? Have I said something I shouldn't?" In Red Harvest, the Op travels to Personville, a small town more commonly referred to as Poisonville because of the rampant corruption. The newspaper editor who hired the Op to clean up the town in murdered before the two can meet. The Op does some investigating, learns what he can about the different mobs based in the town, then uses a campaign of lies and half-truths to turn them all against one another. Basically, he cleans up the town by getting the bad guys to wipe each other out. It's great storytelling, with crackling, straight-forward prose that carries the plot along at a fast pace. It's not a long novel, but an awful lot of stuff goes down before the climax. It's packed to the brim with believable characters and more than its share of pure suspense. Thus, Red Harvest stands out as a great example of just how good hard-boiled fiction can be. A couple of years ago, a wonderful 3-volume The Annotated Sherlock Holmes was published. This included all the original Holmes stuff, with detailed and entertaining annotations, plus a number of cool essays. 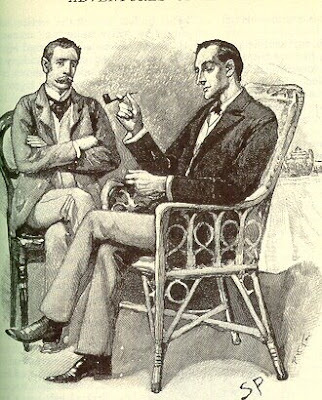 Many illustrations, including those by Sidney Paget (who pretty much defined our visual image of Holmes), are also included. Unfortunately, the set was simply too expensive for me--until I noticed them on sale via Amazon for less than 8 dollars each!!!! I could not pass that up and now I'm the proud owner of all three volumes. This was a few months ago. One of the features of the set is a chronology that sets out the stories in the order they most likely occur, so I have been gradually re-reading the entire Canon in this order. Last night, I read "The Cardboard Box." According to the chronology, that takes me up though 1892. I've still got quite a few years to go before the Master finally retires for good. I haven't re-visited some of these stories in years, so reading them again is great fun. Holmes is perhaps the most perfectly realized fictional character ever created--Orson Welles once described him as "a man who never lived and who will never die." The original stories never get old. And the annotations and essays in this particular set only add to the enjoyment of reading them once more. Sam Glanzman had already done some work in in the comic book industry when he entered the Navy, serving aboard the destroyer U.S.S. Stevens in the Pacific theater. After the war, he eventually returned to doing comic books, working for Charlton, DC and Marvel. It was for DC Comics that he did his most memorable work, writing and drawing around 60 stories, mostly 4 or 5 pages long, about his war-time experiences. The U.S.S. Stevens stories cover all the aspects of war-time service--the danger, the tension, the boredom and the absurdities. They are sharp, excellent vignettes that bring across a very intense and human sense of realism. One story was a comedy, about a fat guy who liked to stand in an open hatch with his shirt off to catch the breeze. Another was a tragedy, about three guys who snuck ashore for some unauthorized liberty, ignoring a warning that there still might be Japanese stragglers still wandering around. Still another is about the ship's first encounter with a kamikaze. These stories appeared as back-up tales in just about all the DC war books from 1970 to 1977. They are yet another--and perhaps the best--example of the excellent quality of storytelling DC was hiding away in Our Army at War, G.I. Combat and Our Fighting Forces. 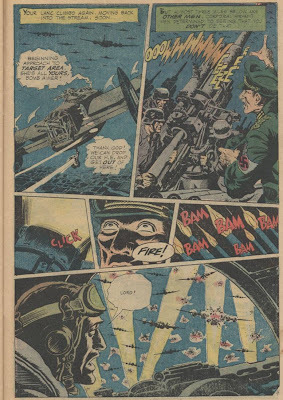 Another really strong back-up story from DC's war comics appeared in Our Fighting Forces #147, cover-dated Feb/March 1974. This one, titled "Arena," was written by Steve Mitchell, a writer I'm not otherwise familiar with, and penciled by Ken Barr. The story is told from the point of view of a young crewman on a Lancaster bomber, flying on his first night-time combat mission. Along the way, he sees other bombers being torn from the air, while his own plane is damaged and one of his felllow crewmen is killed. What gives the story real backbone isn't just the strong art, but also the feeling running through the plot that whether you live or die on one of these missions is really just a matter of dumb luck. You can do your job well, but there's nothing you can really do if a random anti-aircraft burst goes off nearby--or if a German night-fighter happens to target your plane. 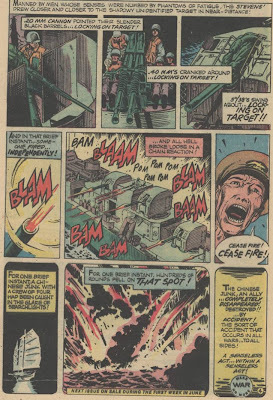 Like the story discussed in the last post, this was yet another example of the great storytelling that appeared in the back of these comics--very human tales that invoke real emotion when you read them.